OSW Review | WTF is happening in TNA? The Hardys set off on their ‘Expedition of Gold’! TNA (aka IMPACT WRESTLING!) is in a major state of change, let’s get ya up to speed! Jan 5th 2017: Anthem Sports announce they’ve majority control of the company. • Dixie was demoted to ‘advisory board’ and still has a 5% minority stake. • Billy Corgan, after contesting, accepted a buyout of his stake and is fully done with TNA. • Jeff Jarrett (and his wife) returned to TNA as Executive Consultant, as well as his boy Dutch Mantell as Creative consultant. This means although Jason Brown is the CEO, Jarrett is pretty much in charge, and Dixie has no say. Jarrett/Anthem have issued new contracts, like his old ones – to pay wrestlers ‘per day of taping’ rather than ‘per episode you appear on’. This is a major downgrade in pay – for example, say you filmed 6 episodes of impact over two days. At $10,000 per episode, you used to be paid $60,000. Now you’re being paid $10,000 per day, so you’re being paid $20,000 for the same work. The other stickler with the new contracts is that they want control over your independent bookings, AND to take a 10% cut. This is a slap in the face, as many wrestlers earn more working indy shows than in TNA. Eh, won’t wrestlers just bail? Yeah, that’s what’s happening. 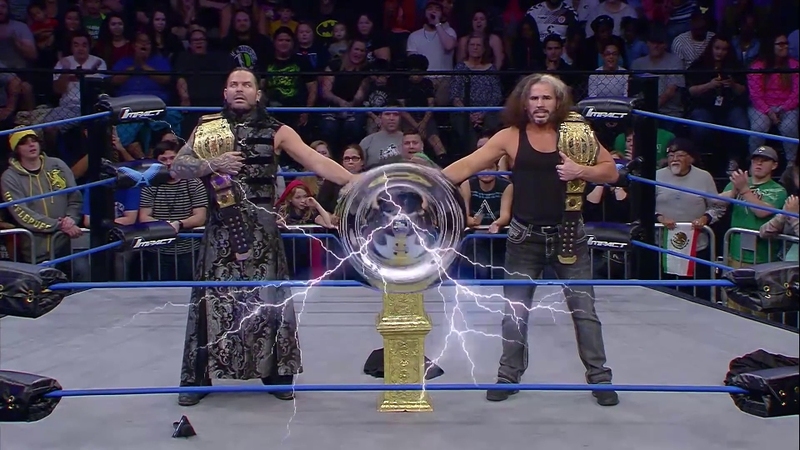 Contracts have expired and weren’t re-signed – The Hardys (oh man! ), Drew Galloway, Mike & Maria Bennett & Jade so far. How come they’re doing all this? This is a *major* cost-cutting measure, and to lock down wrestlers so they can start touring again. Didn’t they lose a lot of money the last time they started touring? Yes, millions. Leaving Orlando was a massive financial mistake. Hopefully they won’t start touring soon. What’s the good news to all of this? RIP Anthem Owl 2017-2017. We hardly knew ye.